As season four of "Downton Abbey" continues, watch for the surprising development: This season, Downton's humble cook is stealing the show with some of the most clever lines! The Dowager may be known for her one-liners (many have gone viral on the Internet and are slapped onto products like pillows and coffee mugs), but Mrs. Patmore definitely competes in terms of quick wit. 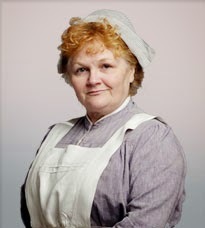 Mrs. Patmore is "the Winston Churchill of the Downton Abbey staff" as a fan described her on the PBS website. That is so true! Of all the Downton Abbey characters, Mrs. Patmore offers the most practical morsels of wisdom. She says it like it is! "There is no shame in hard work." "You can spend too long on one-sided love." "Nothing's as changeable as a young man's heart." "Anyone with use of their limbs can make a salmon mousse." 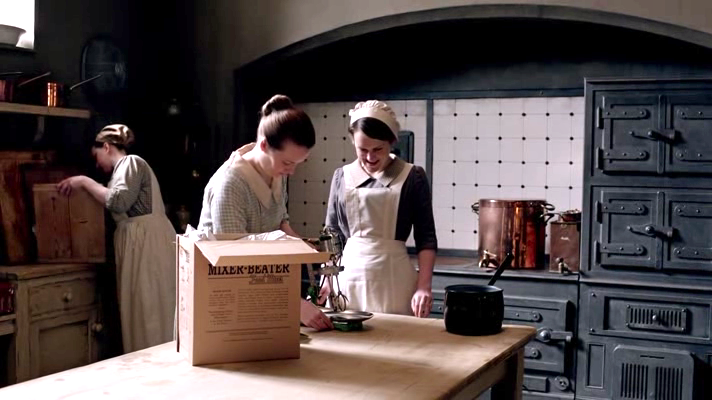 There's a fantastic scene in "Downton Abbey" episode one of season four, where Mrs. Patmore gets frazzled when attempting to use an electric mixer. 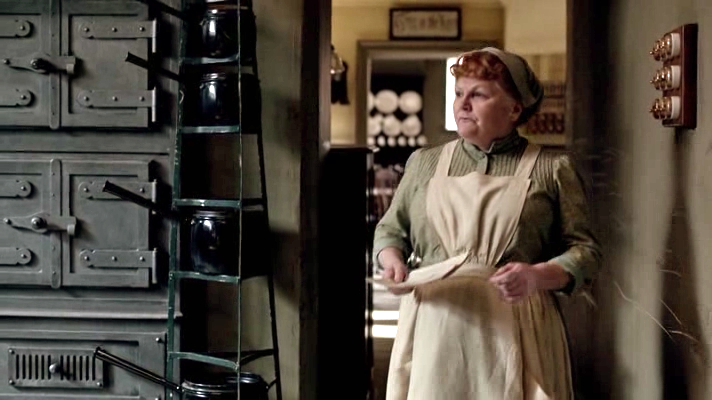 At this moment, Mrs. Patmore's humanity comes across in a very honest way. I love that Mrs. Patmore is confident yet at the same time vulnerable and authentic. 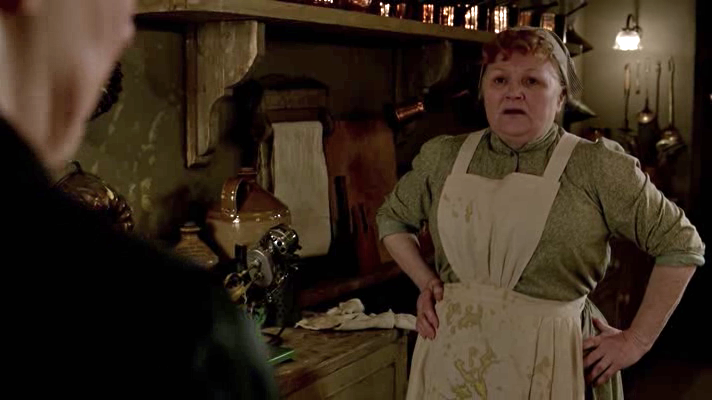 Mrs. Patmore is one of the most well-developed characters on the show. She keeps it real. I relate to her working class perspective more than I can comprehend the landed gentry's point of view! So take Mrs. Patmore's advice. Don't use electric appliances! An electric mixer does help for a few recipes such as mousse and whipped cream. However an electric mixer is absolutely not necessary to prepare most baked goods, including pie crust, cookies, cakes and scones. In fact, if you make scones by hand, then the results will be SO much better! You can not compare to the lightness and fluffiness of a handmade scone. 1.) Preheat oven to 450 degrees Fahrenheit and line a baking pan with parchment paper. 2.) Combine the flour with the butter. 5.) Incorporate the sugar, salt and baking powder by gently mixing with a wooden spoon. 6.) Stir the egg into the flour mixture. 7.) Add the cream, mixing with the spoon. 8.) You should have a soft moist dough that you can easily pat into a ball. If it is too dry, then add a little more milk. Cut the dough in half and shape into two equal-size balls. 9.) Place the ball of dough on dough on a clean, floured surface (any surface will work: countertop, tabletop or cutting board, as long as it's smooth). 10.) On the floured surface, knead the dough (one ball at a time): Use the palm of your hand to press the ball of dough into a flat round shape about an inch thick. 11.) Then fold the dough over and press it together. 13.) Finally form the dough into a round that is 6 inches in diameter and 1 inch high. 14.) Cut the round into small wedges as if you were cutting pizza slices. 15.) Place the wedges of dough on the lined baking pan, with an inch of space between each scone. Bake for about 15 minutes until the scones are golden brown. 16.) Serve the scones fresh out of the oven, while still warm. Accompany with clotted cream and fruit jam or lemon curd. Lemon curd is the classic choice that you would see on most English afternoon tea tables. 17.) Try making your own lemon curd at home. Here's a lemon curd recipe from Jennifer McHenry's "Bake or Break" dessert blog. However you may want to cut the recipe in half, since you won't need that much for a small tea party. Enjoy the scones with hot tea for an afternoon snack or serve with finger sandwiches and sweet treats for a proper "afternoon tea" service. If you're feeling more ambitious, then take it to the next level and host a tea party in "Downton" style! Thanks! Hope that you find the tips useful! Looks amazing! Will have to make it next week. I am behind about 4 episodes, who wants to bake these scones and come over for a "Downton" and Scone Marathon!